Whether you’re in charge of preparing this year’s holiday feast or just making a weekday meal for yourself, the SmartPan 3-Piece Knife Set has the right knife for the task. Save 50% on the entire set this holiday season. 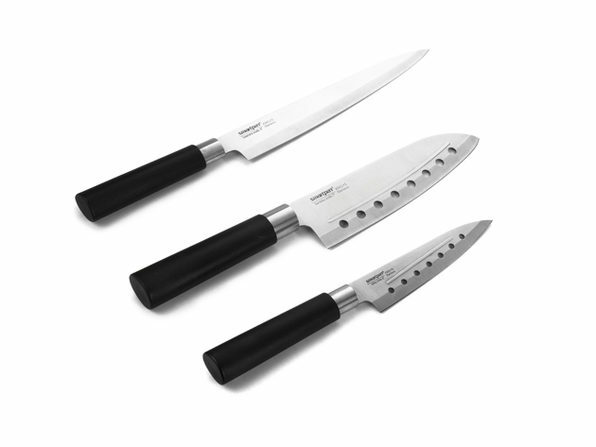 The carving knife’s narrow blade cuts a tough or flaky fish with ease, the santoku knife’s perforated edge cuts beef or chicken into any size, and the utility knife’s short blade cuts fruit or veggies quickly. The knives are powerful but easy enough for even the most amateur chef to handle. The expert home chef or recent grad who doesn’t know their way around a kitchen will put the SmartPan 3-Piece Knife Set to good use. Save $20 for a reduced price of $19.99 for a practical gift without a big price tag. Add the SmartPan 3-Piece Knife Set to your kitchen repertoire by buying it in the Daily Caller shop for $19.99 today. Get an extra 15% off this holiday season by using the coupon code MERRY15 at checkout, bringing the price down to $16.99. You can find even more great deals like this at The Daily Caller Shop. While you are there, make sure to check out our 2018 Christmas Gift Guide for ideas and deals this holiday shopping season.